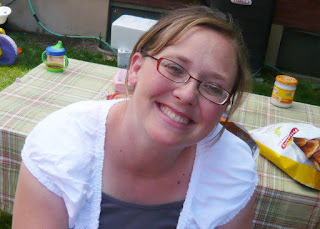 my older, and much wiser, sister turns 34 today! happy birthday katie! if i EVER need anything i can call katie and KNOW that by the end of the call i will feel better about whatever was on my mind. she has a great ideas, gives great motivation and support, and is a great hostess! thanks katie for being such a wonderful person. LOVE YA! yesterday my mom went under the knife and had her right knee replaced! poor mom! this has been extra stressful for her because she had been through it before with her left knee so she knew what the pain and recovery would be like. now, on the other hand, the rest of us could not have been more thrilled when we heard she was going to get her other knee replaced because we saw how much pain she was in and that all her activities were VERY limited. we love you mom, and hope you have a speedy recovery! we will all be here to help you with whatever you need. to your new knee...hip-hip-hooray! hip-hip-hooray! this is a little box we put together that she can keep by her chair to keep her mind busy. try-it-tuesday...and if you like applebee's quesadillas than you will love these (at least that is what my husband says)! combine salsa, miracle whip, and chili powder together and spread evenly onto bottom halves of tortillas. top with chicken and cheese. fold tortillas in half to enclose filling. cook in skillet sprayed with cooking spray on medium heat for 4-5 minutes on each side or until both sides are golden brown and cheese is melted. cut each quesadilla into 3 wedges to serve. today my second blurb book arrived in the mail! it is so rewarding to see all my journaling efforts and all of our fun pictures (which i NEVER print) printed out into a nice, lovely, black book (my choice of color...you can choose any color you like)! 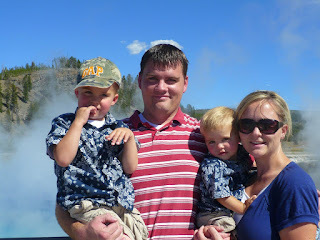 i LOVE them and i recommend blurb.com to anyone who keeps a blog. it's a LOT of work, but blurb.com makes it as easy as they possibly can. i get the 7x7 size and it is just perfect. do you like? now i have to get to work on book three...which will consist of july-december of 2008! here are some of my favorite pages from book two (january-june of 2008). today, during all my down time (yes, it's 3pm and i am still in my pj's), i had a memory come flooding back to me and i wanted to write it down. growing up in my home there was a rule that you HAD to answer the phone "manwaring's, this is _______. (fill in the blank with your name)." and then we had to ask "may i tell them who is calling?" i don't know how my parents came up with this rule, or why. but, i am sure that when you called our house it was a pleasant experience. you never had to guess out of the eight kids which one you were talking to. i had friends that would call our house just hear us answer that way and then laugh about it. i also had friends that would ask to answer our phone if it rang while they were over so they could answer it by saying, "manwaring's, this is _____." oh, the memories! anyway, i was thinking about this today because i miss telephone etiquette. most of the time people answer the phones simply by saying hello (me included) and you almost feel like you have to guess who it is and try to think of how you are going to phrase the next question..."is your mom home? ", or..."is this _________?". then you have some people who just see that they missed a call from your number (not knowing who you are), they call you up and ask "did i miss a call from you? who is this?". by that point, you probably don't even remember who that number belonged to. strange! this was probably sparked by the dozens of phone calls i had to make yesterday trying to find a substitute for nursery. maybe i will just start answering my cell phone, "ward's, this is becky." does anyone else miss the good ole days of home telephones? maybe we were the only ones who had to answer our phone this way. enlighten me. i found a sub for nursery, washed the clothes, packed them up, talked the trip up with owen, and packed the car. we were all set to go! 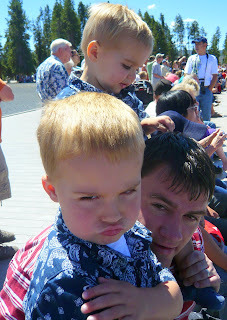 we had been looking forward to our trip to boise, id for months! the plan was to stay with my friend stephanie, spend all of saturday at roaring springs, and then get a babysitter saturday night so the adults could have a date night! it would have been perfect. when the boys woke up friday morning with runny noses i should have known that a storm was a brewin'. but i didn't want to jinx things. around noon they were both feeling a little warm. so i gave them both tylenol and put them down for their naps. then my nose starts to run. three o'clock...owen wakes up and has an accident in his underwear (the runny kind). this is when i start to get nervous. but, kevin arrives home from work and we load up the car and try to forget about it. we say a family prayer and start to head for the door and owen exclaims he has to go to the bathroom. it's explosive. we get nervous but, owen wants to get in the car and head to "steph's and joey's". so we gather up all our things and start out the door and...it's owen...again! i take him to the bathroom and we decide to just sit and relax a few minutes to make sure he's got it out of his system. we wait. looks good. we bolt out the door and make it all the way to the gas station. i call steph and warn her we are running late and that owen has the runs. we fill up our car and head towards the freeway. owen's gotta go again. by this time we are barely passing our apartment (since the gas station is just one block away) so we pull in and kevin takes owen up to the bathroom. by this time my head is pounding, my nose is a faucet, and i have already used almost all of the kleenexes on wesley's poor nose. but, we continue on! 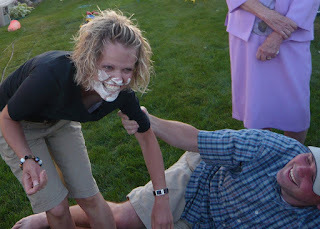 we REALLY wanted to go to boise. about 20 minutes into the ride owen is requesting a bathroom and we beg and plead with him to hold on a few more minutes so we can make it to blackfoot, id (30 minutes from idaho falls). we make it to the flying j and kevin takes owen into the bathroom. i'm starting to feel a little warm myself and the skin around my nose is practically bleeding from all the blowing. kevin and owen return and we sit in the parking lot debating on what to do. i call steph to fill her in and owen starts screaming for the bathroom. kevin takes him into the flying j a second time. they return. we debate. i take owen into the flying j. we debate and kevin decides to go into walmart to find some anti-diarrhea medicine for owen. no luck! by the time he gets back to the car he has to take owen into the bathroom and they don't quite make it! now we've got a situation! i call steph and tell her there is no way we can make the drive at the rate we are going. plus, we would hate to show up sick and the trip not be fun and leave them with the bug. 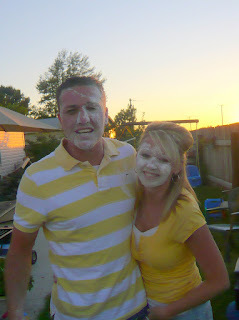 so, we drive over to my brother's house (who lives in blackfoot) and clean owen up. we end up spending most of the evening at their house eating taco time and playing wii fit in between the SEVERAL bathroom runs. by the end of the night i am experiencing a full-on head cold! so glad we decided not to make the drive. we made it home with no accidents and put the boys to bed (wesley required a little benadryl) and settled in for a LONG night! the boys actually slept through the entire night but i was awake every three hours with a crackling head, one runny nostril, one stuffed nostril, itchy eyes, and a sore throat! NO FUN! i am still in my pj's at 11am and have no desire to get dressed, but...the boys are doing GREAT! 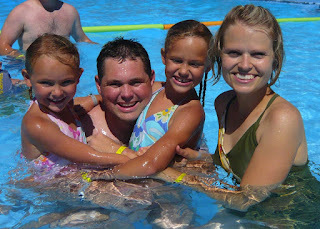 i would rather be at roaring springs! yep, that is pretty much what i have been doing the last few nights. sitting in my wonderfully comfortable chair while digging deeper and deeper into my novel (the secret life of bees...highly recommended)! today i have been playing catch-up with the laundry and house work...but, it was all worth it. i'm not sure why kevin took this picture. probably to document that i do get a break every once in awhile. and actually, every time i look at this picture i can't help but relax all my muscles and smile. i look so peaceful and comfortable. ahh, nothing like a good read. ps elena, i am good and ready to dive into breaking dawn. pps mom, did you know they have made a movie based on the secret life of bees? it comes out in october. a must see! here is my recipe contribution for try-it-tuesday. i found this on kraft foods website and it is SO easy! see other recipes by clicking here. coat chicken w/shake n bake and place in greased 13x9 dish. bake 20 min or until chicken is cooked through. meanwhile, cook rice as directed. beat soup & milk w/ wire whisk until well blended. pour evenly over chicken, sprinkle with cheese. bake additional 5 min. or until cheese is melted & sauce is bubbly. 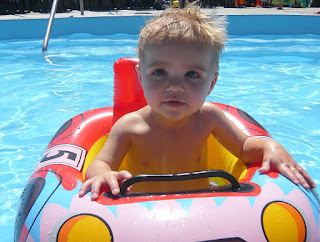 little eli (my nephew) turns one today! happy birthday buddy! eli is a good-natured, happy little boy! 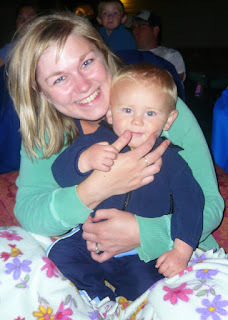 and eli and wes will be great little pals (i'm seeing it already)! happy birthday eli! see you tonight! 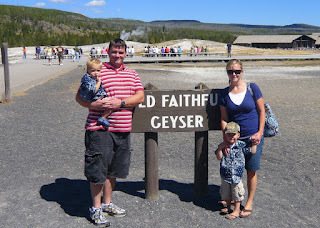 our last stop was at the lower geyser basin to see the fountain paint pot. me and kev in front of silex spring. 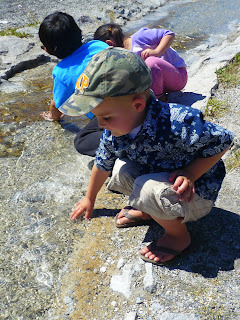 owen in front of silex spring. this is 27 ft deep. isn't it beautiful? and, on our way out of the park we were lucky enough to see THIS! 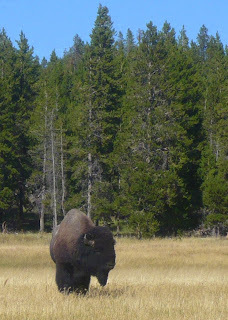 a buffalo. and he was LARGE. about 30ft away was a stupid kid egging the buffalo on and he was wearing a RED SHIRT! where was his MOTHER?! some kids. 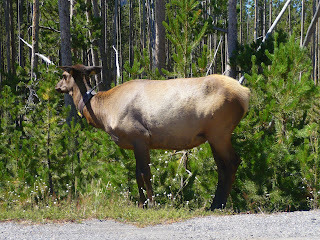 so, we saw LOTS of elk, a buffalo, a bald eagle, and some kind of water rat. our trip was a success...don't you think? the grand prismatic spring was pretty grand, but a little hard to see because of all the steam. 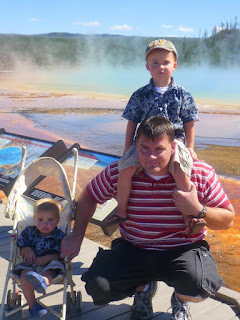 wes, kevin, and owen in front of the grand prismatic spring. 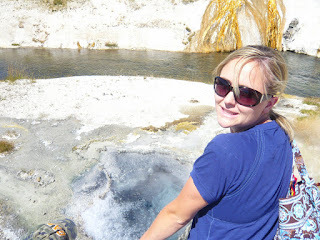 this place made me SO nervous because there were no railings along the trail of steaming hot water. i made kevin carry owen the entire time. 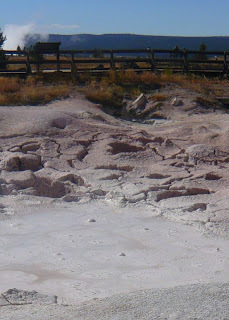 PLUS, it surely didn't help that on of the hot springs had a sign saying that it last erupted in 1985 and they have no idea when it will happen again! i felt like i was walking on a ticking time-bomb! i was thrilled to be able to walk away without any eruptions (you know me...if something bad can happen i think it will)! kevin and owen in front of the turquoise pool. check out that view in the background! and, on our way out we had to stop and play in the water. have you had enough yet? i didn't think so...i'll continue. on our way into the lodge (to cool off and get some ice cream) we saw this beauty! how fun would it be to take a tour in this ride?! 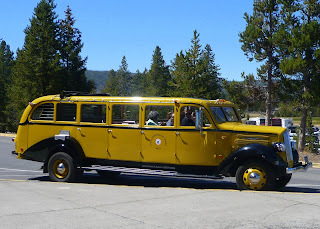 they actually used these 13-passenger touring vehicles in the park more than 20 years ago and now they have been completely refurbished and reintroduced last year. 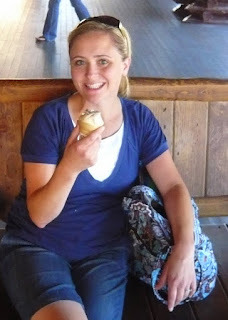 tin-roof sundae ice cream cone...life is good! after the ice cream we got back in the car and started our way out of the park. but, we had a couple more stops to make. midway geyser basin: featuring the grand prismatic spring, which is the largest hot spring in the united states. this is us in front of the turquoise pool. you can't see it, but don't we look cute? 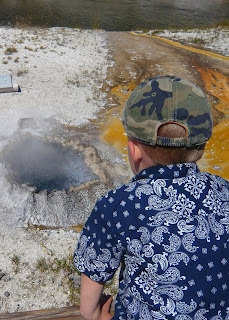 around old faithful you can talk other trails that lead to even more hot spots. so we took a little detour and went down one of the loops. me cheesing it for the camera. all this hot water was driving owen crazy! he just wanted to touch it SO BADLY! 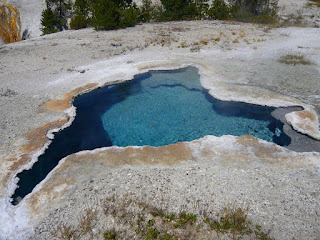 can you believe how blue this hot spring is. you could see it bubbling from the bottom. incredible! 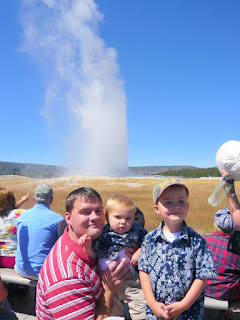 my boys in front of old faithful. we were sitting down-wind of the geyser and so we received a light mist during the show. owen loved it! he even took his hat off to enjoy the light mist. 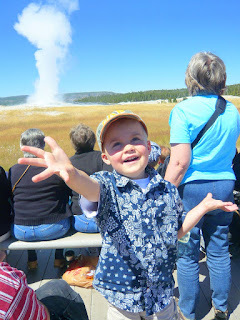 on our way to old faithful lodge owen found a little run-off from the geyser and decided he needed to touch it. it wasn't fenced off so we thought it would be okay. plus, there were other kids doing it first! (; the water wasn't hot...just luke warm. 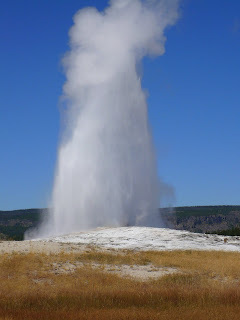 next stop...old faithful! old faithful erupts every 92 minutes (on average) and we got there with 40 minutes to spare. 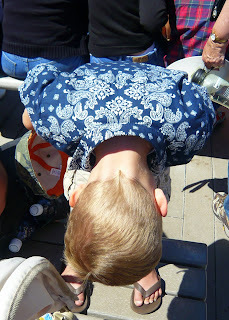 so, we carried in our sack lunches, found a good seat, and prepared for the show. it took some major entertaining to keep these boys happy. but we survived. 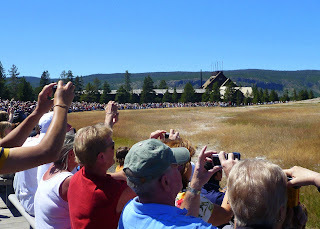 right before old faithful erupted i couldn't help but turn my camera towards all the thousands of people! i swear every single one of them (okay...us...me included) had their cameras in the air. so funny! 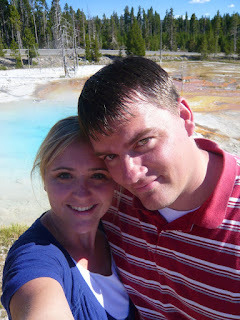 today we opted for a break from the norm and took a drive to yellowstone national park...courtesy of staci and kyle (they left us their pass from their honeymoon since they were heading to illinois for the weekend). 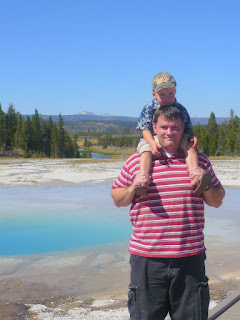 it has been at least a decade since either one us has been so it was so fun to rediscover everything (well...as much as you can fit into one day) that yellowstone has to offer. 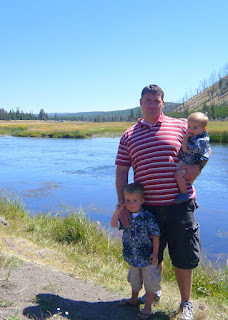 the west entrance to the park is less than 2 hours from idaho falls. we pulled into west yellowstone at 10:30am and went straight to the imax theater to see the film bears which was showing at 11am. the film was only 30 minutes long so the boys behaved for a good portion of it. plus, when we bought our tickets they gave us two "gift bags" and they each had 4 granola bars stuffed inside...so that always helps with keeping two toddlers quiet! 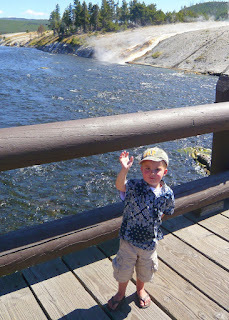 next, we entered the park and we immediately had to stop next to a river so owen could throw some rocks. 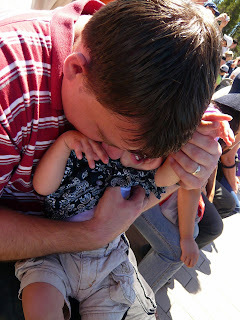 we had a great time enjoying the peacefulness of the park. the sky was SO CLEAR, the weather was perfect, and the fish were jumping! 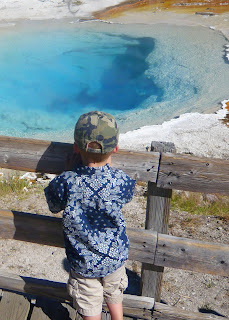 my mom found out we were thinking of going to yellowstone national park yesterday and got owen all sorts of excited about seeing coyotes, wolfs, buffalo, and bears! so we were PRAYING that we could see some sort of wildlife. 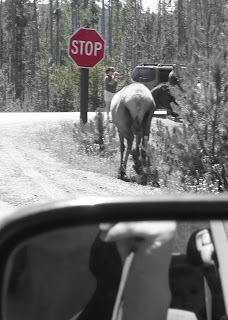 and sure enough, just as we were turning onto firehole road (on our way to old faithful) we spotted two elk (at least we think they were elk. how do you tell the difference between elk and deer anyway?!). one thing i LOVE about this park is that anytime you see cars pulled over you KNOW you are in for a TREAT. everyone else does the spotting work for you! i love that! 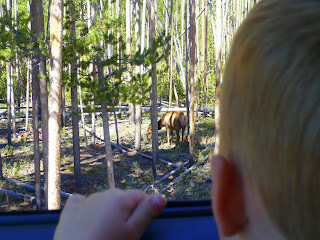 owen checking out the "elk". 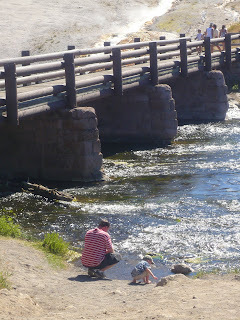 in the late afternoon we made the trek back to idaho falls to clean-up. then, it was off again to my parents house for hamburgers and hotdogs grilled to perfection by benjamin. once the sun went down brandon presented a video he had created of our family outside with a projector. it was full of great music and pictures that brought a lot of memories. and we all walked away with a copy. thanks for all your hard work brandon! thanks again brandon and emily! you guys put on a great reunion. now go and enjoy CANCUN (you lucky dogs)!